This, I know, has become wearily repetitive, but the rewards of the Berlin Ring were once again shown to be entirely musical. Götterdämmerung had for some reason acquired a third dramaturge, prior instalments having relied upon a mere brace. What they might have done, or rather what director Guy Cassiers might have listened to, is utterly beyond me. For all its faults, and it seems to me undeniable that Götterdämmerung was a bit of a mess dramaturgically, Keith Warner’s Covent Garden Ring had ambition, had ideas, and some of the time managed to communicate them. This sorry co-production with La Scala, brought to us courtesy of the Toneelhuis Antwerpen, appears, quite literally, to have nothing whatsoever to say to us. That would be odd in the case of any musical drama worthy of the name – many are not, but that is another story – but, in the case of Der Ring des Nibelungen, it is simply beyond comprehension. Yet again, we are simply faced with a few ‘tasteful’ costumes and effects, and in this case, far too much video. The Tarnhelm dancers return, rather to my surprise offering the saving grace of the staging. 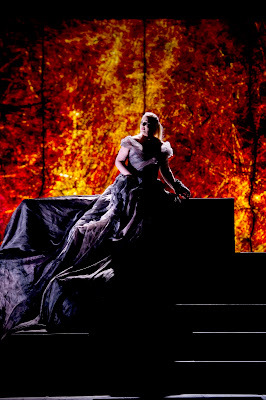 Their menacing writhing around Brünnhilde during her shameful and shaming possession by Siegfried struck a note of rare, indeed unique, dramatic power. The appearance of sub-Damien Hirst creatures in formaldehyde offers slight variety, but no discernible point, and more than anything irritates in its acquiescence to the wearisome stylisation of the designs. As I said with respect to Siegfried, we might as well have been at the Met. Of Wagner’s desired ‘emotionalisation of the intellect’, Cassiers offers neither emotion nor intellect, let alone a dialectic between the two. Baffling! If not on quite such superlative form as in Siegfried, Daniel Barenboim and the Staatskapelle Berlin nevertheless did Wagner’s score proud, a more than promising augury for the forthcoming Proms performances of the Ring as a whole. (I shall be speaking at an introduction to Siegfried.) Line and dramatic momentum were impressive, though tension sagged slightly – and surprisingly – at a somewhat anti-climactic conclusion to the second act. Maybe that was a matter of tiredness more than anything else. Barenboim’s almost ‘French’ ear for colour – he knows that Wagner leads to Debussy as well as to Schoenberg, and indeed employs that ear in the music of the latter composer too – offered more than its fair share of textural revelation, the Staatskapelle’s woodwind as euphonious here as in Mozart. Eberhard Friedrich’s chorus acquitted itself very well throughout. There was a great deal to praise in terms of singing too. Waltraud Meier as Second Norn must be the very definition of luxury casting. Stage animal that she is, she made something out of the non-production even here, let alone in her well-nigh definitive Waltraute (also one of the very few redeeming features of the recent, dismal New York Götterdämmerung). Meier can have few peers, if any, and certainly no superiors, in her melding of text and music, in her instinctive yet searching theatrical communication. She offered a standing rebuke to the vacuity of the contribution from Cassiers. Iréne Theorin continued to present a creditably variegated account of Brünnhilde’s part. There was more of the lyrical, less of the heroic, than one often hears, though there remained plenty of the latter nonetheless. I wondered occasionally whether her choices with respect to scaling down, to containment, always made the best sense, but there was a great deal to admire here. Mikhail Petrenko’s Hagen remains controversial. I first heard it in Aix-en-Provence, under Simon Rattle. During the first act, I was less convinced, the relative lightness – this is definitely not the black-toned Hagen we have come to expect – veered on occasion towards the non-committal, though of course Cassiers did not help. However, menace asserted itself, psychotically so, ensuring that the darkness of Hagen’s character duly struck a terror quite lacking in the staging. Gerd Grochowski offered more in the way of clear verbal projection than psychological depth, but again the fault for that may really have lain elsewhere. Anna Samuil’s Gutrune, alas, seemed a victim of miscasting; there was little sense of character and her blowsy delivery, though reined in during the third act, was by any standards stylistically quite inappropriate. The trio of Rhinemaidens (Aga Mikolaj, Maria Gortsevskaya, and Anna Lapkovskaja) was truly excellent, both in solo and ensemble terms. Andreas Schager’s Siegfried I have left until last. Schager was a replacement for the advertised Ian Storey, Lance Ryan having taken the part in Siegfried, but not Götterdammerung. (Schlager had also had to step in for Ryan in the previous cycle, when the Canadian tenor arrived late to the theatre, missing the first act.) I am not sure that I have heard so excellent an account of the role in the theatre; I have certainly heard none better. We can hark back to Melchior all we like, even to Windgassen, but we all know that such expectations are, for whatever reasons, entirely unrealistic. Schager’s Siegfried was of the here and now, dramatically committed – certainly not something of which one could always accuse Melchior – and finely sung, without a hint of the dreadful barking, let alone shouting, that disfigures so many performances. There was no discernible tiring; indeed, a portrayal of youthful, naïve enthusiasm did much of the work the staging ought to have been doing by itself, contrasting tellingly with the corruption of the Gibichung court. This is a production, then, that should be discarded as quickly as humanly possible; it remains just possible, however, that a star may have been born amongst this all-too-tastefully-designed ‘heap of broken images’. Thanks for the interesting review. I'm quite curious to hear Andreas Schager as Siegfried now - to be mentioned in the same breath as Windgassen and Melchior is surely praise indeed! If you're planning another trip to Berlin, you might want to consider Rattle's Gurre-Lieder in October (as part of the 50th anniversary of the Philharmonie celebrations), or perhaps Jansons' Birtwistle/Mahler or Abbado's Mozart/Strauss programmes (with the BP). Thank you! All sound very interesting. Desire is a central coordinate of both Wagner’s story and Cassier’s production in which Lambeaux's Les passions humaines was an almost constant visual motif, though did not arrive in its full form until it descended as a curtain at the end. Even here it was amputated, missing its crucifixion and its winged, grinning skeleton of death. In mutated and hallucinogenic form it was predominant in the video projections. The dancers also suggested the contorted, suffering desire of Lambeaux's bas relief and their writhing forms interacted with those of the video-projections. Desire is not confined to the forces that inhabit the Tarnhelm, as the dancers demonstrated throughout Das Rheingold. In Götterdämmerung the body parts in formaldehyde were fragments of Les passions humaines as if frozen in death rather than depicted in marble. Perhaps Damien Hirst is suggested but so also is the dead nature of empty passion in the Gibichung court under the influence of the ultimate nihilist, Hagan. Inevitably I was left with little puzzles in my mind. There was a nice quasi-postmodern reflection on illusion in Das Rheingold when cameras on the stage apparently portrayed the Rhine Daughters on the backdrop. Well, they did and they didn't. The more that first 'preliminary' scene of the preliminary evening went on, the more it was clear that the cameras were not the source of the illusion. Alberich, no fool he, is seen examining the cameras at one point not long before the Gold appears. This is before he becomes a fool for the Gold and slave to the terrible, unquenchable greed it stirs up in him. Nibelheim had a Baconesque dais on the stage with mirrors. It was not clear what its purpose was, except as an aesthetic device, and it never returned as a motif. Maybe the mirrors suggest a world of representation and another empty illusion. As scenographic devices, the vertical spear-like poles served various functions to excellent effect but at certain points, they bore what looked like the 'digital rain' of falling, computer-screen letters we've seen before in The Matrix. Perhaps these are the moments when illusion is stripped away and we are faced with a mysterious code. Maybe that code is desire itself: the World as Will. If that is the case, we should therefore abandon a convention of dramaturgy in which we read representational codes as key to an understanding of the plot. If we are to lament this production, it might be that it has fully succumbed to the Schopenhauerian interpretation Wagner himself was later tempted to give the Ring. Of course Wagner could not make up his own mind. By abandoning Feuerbach, Bakunin and Wagner’s original intentions for the drama, this production places desire in a universal metaphysical realm rather than in the real world, which it seems to depict both as illusion and as the ‘Calvary of Humanity’ to use the original title of Lambeaux’s work. Pure Schopenhauer. In that respect we lose perhaps the most important dynamic inherent in the Ring, which is a story of the abandonment of the impossible desire for, and indeed slavish submission to another world, a world of myth, a world of the gods. It is also a warning against translating infinite desires of the metaphysical to the plane of the earth, where they can only express themselves in self-destructive egoism, greed and power. This is the Ring as it should be: radical politics. But in Cassier's production, politics are abandoned. Even if it was a little literal and too hippily humanistic, Harry Kupfer’s production of the Ring, pictures of which adorned the walls of the Schiller in a special exhibition, was far more satisfying as a political drama.